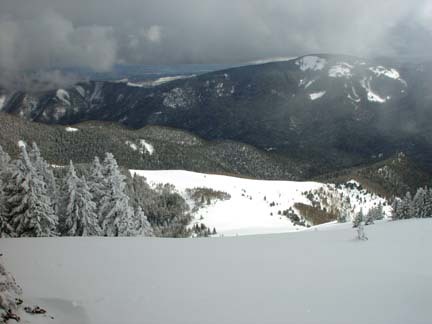 Chicoma Mountain has long enticed me with it's 1400-foot south face of snow. We finally pulled off a winter ascent and snowboard descent. We drove "31-mile road" (Forest road 144) for 20 miles from Espanola before snow shut us down. 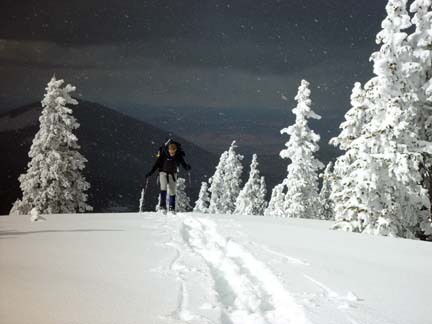 From there we skinned 7 miles on our splitboards along the road and up the north slope of Chicoma to the summit. Round trip distance was approximately 15 miles. Total vertical gain for the weekend including skinning back up the south-southeast face twice was 5600 feet. At 11,561', Chicoma Mountain has the second greatest prominence of any peak in NM next to Sierra Blanca. It's large and wide-open south-southeast face is very obvious especially in winter when blanketed with snow. Driving north in NM along highway 285 the peak stands out significantly. I have eyeballed the south face in winter for over 10 years longing to snowboard down it. I gave it a shot in 1997 with my friend Brian but being on snowshoes and not fully ready for the endeavor, we didn't even come close. This year, armed with split snowboards and a better understanding of the mountains of Northern NM, Bill and I were successful. To our knowledge, our snowboard descent was a first of this peak. It's isolation and difficult winter accessibility make it a great trip for those seeking solitude and adventure. Bill and I left Los Alamos around 7am headed for forest road 144. After a bit of confusion in Espanola about which road, we finally found the correct turn at the road marked for the New Mexico State Police office. This road turns from pavement to dirt in a short time and then becomes more rough, muddy and snowy the further one goes. We hoped the snowline would be close to 8000' feet on the road but once we reached 8000' we realized we could continue on. We were following a set of tire tracks that had gone up but had not come down. Earlier on the road we had encountered huge puddles of water that were frozen over so we knew the tracks ahead of us had not been done the day before. Curious but thankful for the tracks, we continued driving. After rounding a corner at 8,700', we found the source of the tracks, a Ford Bronco stuck deeply in the snow with two people standing outside next to a fire. John and Carlos had spent a cold, sleepless night in their Bronco after getting stuck Friday afternoon while scouting the area for firewood. Bill and I wielded our avalanche shovels and, for the next hour and a half, dug, tugged and finally pulled the Bronco free. So finally around 10:15am, we embarked on our adventure. We had approximately 6 miles of road to skin along before turning off the road to the left up the north slope of Chicoma Mountain to the summit. The skinning went fairly quickly despite having to break trail. Bill skinning along the road during the approach. We alternated breaking trail along the road through intermittent, but strong snow squalls along the way. The beauty in this hike was the quiet solitude of hiking an area few hike in the winter. In fact, after the first mile of skinning along the road, we no longer saw any evidence of anyone being up this way this winter. The road is a popular ATVing area but even the motorized folks didn't venture much beyond the 22nd mile of the road from Espanola. We had the place to ourselves and were loving it. At 10,400 feet on the road, we decided it was time to turn off the road and start the bushwhacking through the trees to the summit. We actually did quite well in picking our way through the trees and after 1,100 feet of light bushwhacking, we broke out of the trees for a fantastic view. 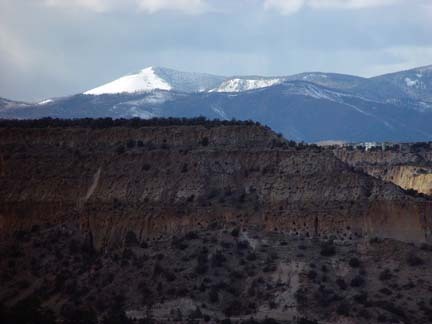 We could see the highpoint of Los Alamos county, Caballo Mountain, to the south and Polvadera Peak to the north. From there it was just a couple more minutes to the summit. The sun was shining and the view was great! Bill skins the final stretch to the summit with Polvadera Peak in the background. It was now 3pm so we had time to take a few summit shots, take in the surroundings and find a suitable camp spot. We found a spot to camp that offered ski out/skin in convenience to the south slope and quickly erected the tent and moved in. With time to look down the south slope we intended to ride, we decided to make a run down about 1,000 feet to sample the goods. Looking down the wide-open south slope. We strapped on our boards and slid slowly down to the start of the slope. The snow was good but looked a bit thin on the truly south-facing side. Views from Los Alamos in the past had shown me the southeast side tended to hold snow better due to the wind-loading it received and the more easterly aspect. That would be our plan--ride right along the crest of the ridge in the transistion area between the south slope and southeast slope. I lead off and headed down about a third of the way down the slope where the snow started to get really nice and soft. I paused to let Bill pass by so that I could take a photo. 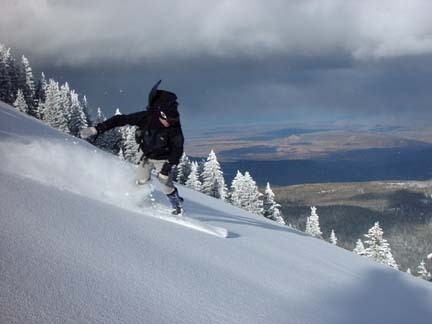 Bill carving up the goods with the Espanola valley in the background. We did indeed find the snow to be a bit thin and rocky on the south slope but the snow on the more easterly aspect was fantastic! I watched Bill ride the rest of the way down the 1000-foot face to the first small shelf stopping by a barbed-wire fence that was barely protruding from the snow pack. It was my turn. Enjoying making the powder turns on this slope I had imagined for years I let out a short whooping holler while making short, soft turns. But as quickly as the riding started, it was over. 1,000 vertical feet in powder goes very quickly. I gave Bill a high-five as I rode up to him. Time to break the boards into skis and skin back up. The skinning up went without issue and we were back at the tent at 5pm enjoying a serene, golden sunset view. Dehydrated meal for dinner and it was time for the tent. 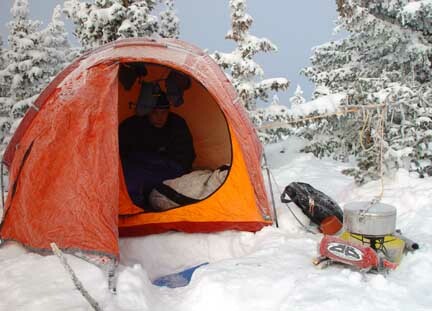 There's always that waiting game where one lays in the tent waiting as long as possible before actually committing to sleep for that last trip out of the tent to urinate so you can sleep in as long as possible for it to warm up outside. So we waited until 9pm before last urination call and sleep. We exited the tent at 7:30am in a layer of fog. The overnight low was only 15F so not a bad night. I had my 20F sleeping bag for the trip so a few extra layers of pajamas were necessary. As best we could tell, only the summit of Chicoma was in the clouds. We melted enough snow for a quart of water each before strapping into our snowboards for another run down 1400' vertical. 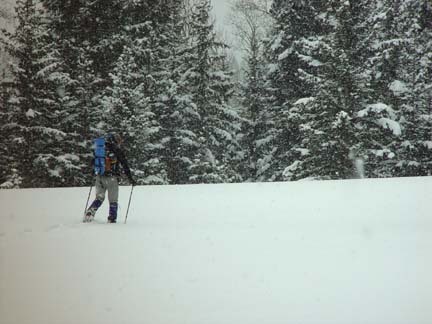 This time we ventured a bit deeper into the southeast face and found better snow conditions during the run. Stretching out the run as much as possible we rode down to secondary shelf under a sunny sky before stopping. The snow continued but we figured we'd better start hiking back up and out as we had to get back to town by 5pm. The skin back up was quick and by the time we reached the tent it was mostly sunny on the summit. We cooked dehydrated Denver Omelettes and added cubed cheese and pepperoni to spice it up. Yum. We packed up camp and started our descent at 11am on skis with skins as neither of us can ski very well especially on a snowboard split into skis. The going through the trees was quick and efficient with a nice grade and our skin track to allow us to slide down at a controlled rate. We reached the road after about 40 minutes through the trees. The road was less efficient skiing as the grade was much lower but we still made great time and were back at the jeep a little after 1pm. The drive out was chock full of mud and wet snow but was uneventful. We arrived back in Los Alamos around 3pm. A look at Chicoma from just outside Los Alamos. Look closely and you can see our tracks. (Just kidding). Written by Jason Halladay on 27 February 2005.